The Draft Model Tenancy Act 2015 is all set to encourage the rental market, as it promises to safeguard the interests of both landlords and tenants. 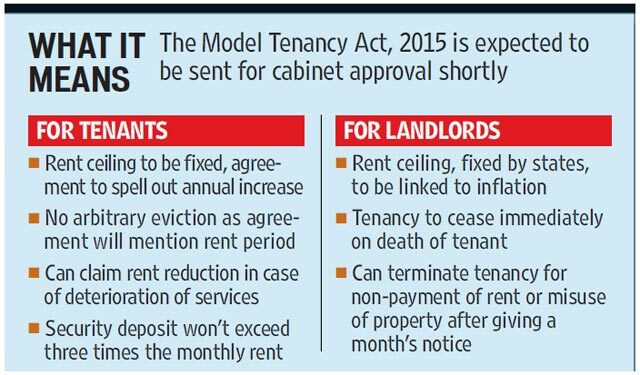 The housing and urban poverty alleviation ministry has readied the draft of the Model Tenancy Bill, 2015, doing away with some archaic rules that govern this sector. The draft will soon go to the cabinet for its approval. "Currently, almost all states have their own rent laws. But many of them have become archaic and failed to serve their purpose. The opaqueness has not only made renting out properties a tricky affair for landlords but taking a house on rent has become a nightmarish experience too. Many tenants are forced to cough up arbitrary rent hikes or face eviction," said an official. Draft Model Tenancy Act, 2015, if accepted, could unlock the doors of huge number of properties that are lying vacant currently, thus providing a solution for India's housing problem. But it is easier said than done. The Draft proposes several reforms to the earlier Rent Control Act, 1948, which was seen as outdated and partial to tenants. The new Draft seeks to balance the needs of both tenants and landlords. For instance, as per the provisions of the Rent Control Act, rents of properties were capped and landlords could not raise rents despite the jump in property rates. Thus, many tenants ended up paying a paltry rent of about Rs 100 despite living in prime locations. The Draft proposes reforms that will enable landlords to charge market rates and make it easier for landlords to evict tenants who default on rent without getting into long drawn out legal proceedings. This move is expected to give a boost to the rental housing market. "Earlier, property owners avoided giving their property on rent out of the fear that tenant will never vacate their property. With the proposed changes, house owners can relax and a huge number of properties lying vacant can be used to not only generate additional income for them, but also solve the housing problem of millions,'' says Ashwinder Raj Singh, CEO - Residential Services, JLL India. "There was a need to unlock the greater potential of the housing sector,'' says Ashwinder. Speaking on the impact on property prices, he feels that the move will not bring down property prices. "The landlord can now give the property on rent. He will earn an income on his investment, so there will be an incentive to invest in property,'' he adds. The Draft also has provisions to protect the interests of the tenants. Currently, the security deposit paid by tenants is an ad-hoc amount. As per the draft, the security deposit cannot exceed three times the monthly rent. Besides, tenants can claim a reduction in rent if the quality of services deteriorates. "It's a win-win situation for both house owners and tenants if they play by the rule book,'' says Ashwinder. While the Draft permits landlords to raise the rent, the tenants need not fear arbitrary hikes. This is because the Draft has proposed a ceiling on the rent that is to be fixed in consultation with the state government. Besides, landlords cannot evict tenants as per their whims and fancies, but have to follow the terms of a written agreement. Also, tenants below a certain threshold are protected in that the terms of the Draft are not applicable to these select categories. "Senior citizens who are actual residents, widows and single women, persons released or retired from the armed forces, are among the special categories of persons,'' - as per The Draft Model Tenancy Act 2015. Among the many reforms included in the Draft is the proposal for an independent authority for registration of all tenancy agreements and a separate court for rent related disputes and litigation cases. The rent agreements need to be registered with the Rent Authority. Further, the Draft has proposed that all disputes will be heard at the Rent Courts set up by the states. The Civil Courts will no longer hear rent related cases. As land is a state subject, it is up to each state government to decide if they wish to adopt the proposals of the Draft Model Tenancy Act. 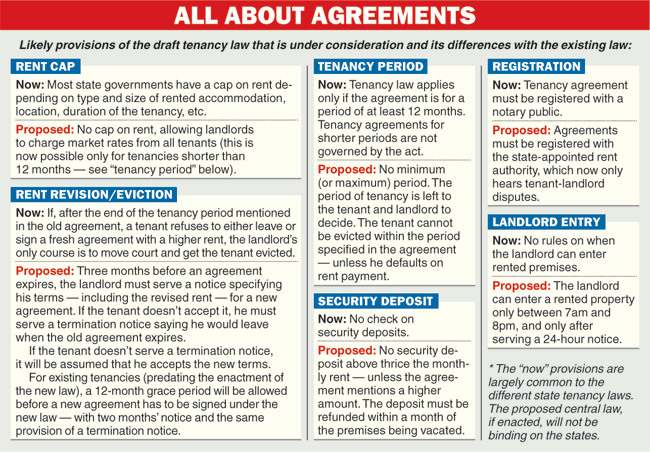 However, given the resistance of the tenants to any changes in the rent laws and due to vote bank politics, it is unlikely that the proposed Draft will replace the old Rent Control Act in a hurry. We at FlatGradings.com have started petition on change.org to Regularize Security Deposit. This petition will give a push for the State Government to implement The Draft Model Tenancy Act 2015. Please sign if you support the cause. Also, please share your experiences living in an apartment on our platform http://www.flatgradings.com/write-review-form and help others make an informed decision before moving into new apartment ! Majority of New York real estate firms are employing brokers who can speak more than one language as they feel it is important to accommodate buyers and sellers from diverse backgrounds. There are however a few disadvantages of real estate investing. If you rent out a house there is really no guarantee that the renter will honor their agreement. If they stop paying you rent today then your asset quickly turns into a liability as you will still have to cover the mortgage but will not have any rent money to do it with.